Considered by orchid aficionados to be among the most beautiful of all orchid species, Trichocentrums are epiphytes naturally distributed through Mexico and Florida down to South America. Colloquially named Mule-Ear orchids, these plants have quite large leaves—up to twenty-four inches long. These leaves are stiff and upright, and they grow from the base of small, clustered pseudobulbs; they’re also unusually shaped and often spotted with purple on the surface, giving Trichocentrums their nickname. 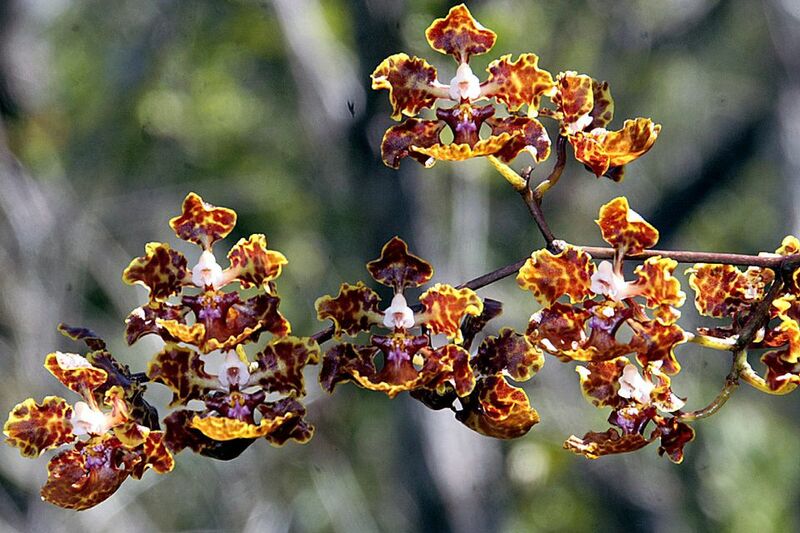 There are currently sixty-eight species in the genus: many species were recently moved from Oncidium into Trichocentrum, expanding the genus’ size and leading to some taxonomic confusion between botanical sources. They also bloom flowers that grow from inflorescences at the pseudobulb. Some of these flowers are small, about two inches across, but some Trichocentrums like T. tigrinum have leaves so large they almost cover the entire plant. Like the leaves, the flowers of Trichocentrum plants are often spotted purple. Further, some species have spurs arising from the lip of the flower: it is from these spurs that the genus derives it name, as tricho means “hair” and kentron means “spur” in Greek. These epiphytes hybridize easily with other orchids and their large leaves make them a great ornamental orchid for tropical gardeners. Light: Lots of bright light. If flowers are starting to fade or droop, however, the plant is probably getting too much sun, and it should be scaled back. Water: These should be watered daily and kept in a moist environment to mimic the tropical conditions in which they thrive. Temperature: Warm tropical temperatures above fifty degrees Fahrenheit. It ​is not frost tolerant. Soil: These are epiphytes that can be mounted or grown in hanging baskets. A fast-draining epiphyte mix like chopped sphagnum moss is best. Fertilizer: Feed monthly with a balanced, diluted fertilizer like a 20-20-20 and scale up the plant’s feeding if its blooms are insufficient. Trichocentrums propagate from seed. Growing these orchids from seed, however, is fairly difficult—they must be grown in a sterile environment, given lots of nutrients and growth hormones, and kept warm and well-fed for quite a long time before any leaves or roots begin to develop. Should you cultivate these plants, buy established specimens from a nursery or online. Repotting can be beneficial for Trichocentrums but doesn’t need to be done too often—once every two years or so should be sufficient. Repotting epiphytes is a matter of keeping the roots safe, so be gentle with the orchids’ root systems when moving them into fresh medium. Choosing to mount these orchids on a vertical surface like a slab or a plaque minimizes repotting as an issue. Of the sixty-eight species of mule-ears, the most common are probably T. undulatum and T. tigrinum. Undulatum, common to South Florida, grows yellow flowers, and tigrinum is perhaps the most beautiful species in the genus; its flowers are quite large and attractively mixed purple and white. This is also one of the easier species in the genus to cultivate. Remember, some species in this genus are crosslisted as Oncidiums, and different sources list different plants as Trichocentrums, so do some research into how the specific orchids are classified. Like most tropical orchids, keeping Trichocentrums in a warm, humid environment is the most important thing, and don’t expose these epiphytes to cold drafts to avoid damaging the foliage. They need a balanced environment with some airflow that nonetheless maintains the hot, moist conditions to which they are accustomed in the wild. Keep an eye out for common orchid pests like scale and mealybugs and enjoy their beautiful blooms: however, note that Trichocentrums are fairly uncommon and may be difficult to get outside of a specialized nursery.